And I thought my migraines were bad! A father and daughter redneck pair see their prize fish get devoured by a shark while they’re reeling it in. Mad about the loss of their prize money, the pair open fire with the cooler full of weapons they brought: guns, harpoons, and even a grenade(!) get tossed at the shark. The boat captain is not too happy about all this (though seemed to miss all these firearms getting brought aboard.) 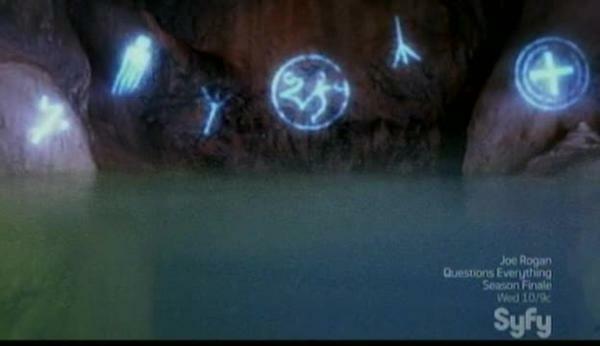 Shark limps to a cave that has ancient runes carved in it, it’s dying breath activating them with supernatural magic. 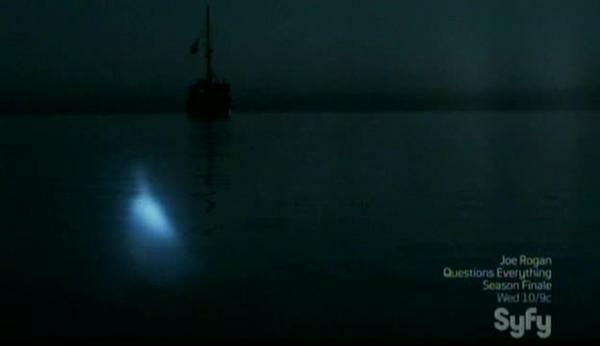 Next thing we know, a glowing energy is hunting down the boat — it’s Ghost Shark! 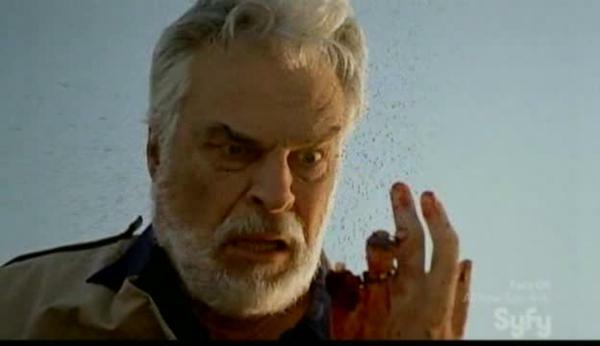 Ghost Shark chomps the redneck family and the boat captain, beginning a reign of ghost terror along the coast. This ghost is the most at the coast, I do boast. So offer a toast. 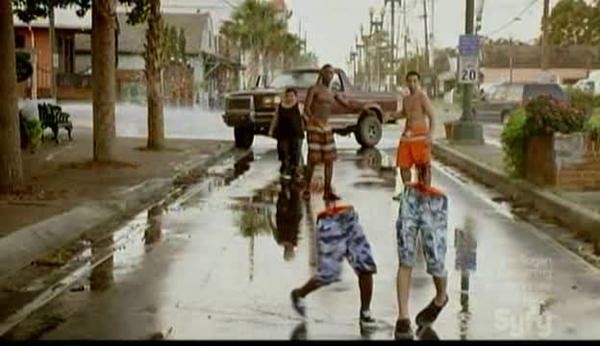 The town has no worry, by the next morning a group of fun-loving teens are headed to the beach for some of that fun that they love. Ava and her sister Cicely are joined by Blaise and his crush on Ava, as well as the mayor’s son Cameron (and his jetski that only he can drive). Portly Mick and bikini model blonde Taylor round out the crew. Ava and Cicely spot their dad’s boat, adrift, the boat from the prologue. They swim aboard and find it empty except for blood stains. Then Taylor is attacked by Ghost Shark! She steals Cameron’s jetski to try to get away, but gets Ghost Sharked regardless! 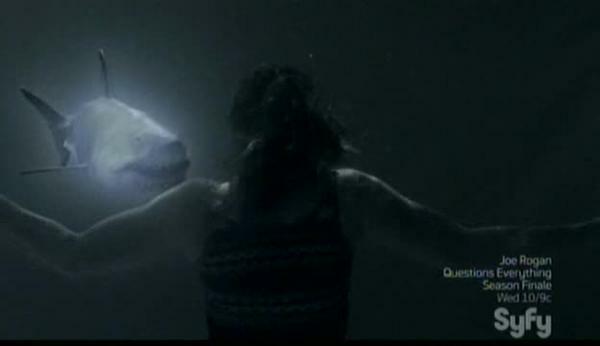 As an interesting not, Taylor’s body is bitten in half, but characters will later say she disappeared, which either means Ghost Shark ate the rest of her off camera or the half-chomped effect (which is repeated throughout the film) looked to cool to not use. Regardless, Deputy Hendricks is the most useless police character in quite a while, not believing any of the dozens of witnesses who mentioned the shark was glowing and not even wanting to call it a shark attack. Nor does he think an abandoned boat full of blood is of any concern. The way he seems to hate the word “translucent” is just bizarre. The Mayor is behind covering things up, because elections and stuff. Shark attacks don’t sit well with Hockey Moms or Nascar Dads, I guess. Only crazy lighthouse keeper Finch seems to know what’s going on, except when he’s not crazy he’s drunk, and often he’s both. Ava realizes the authority figures are terrible and sets out to try to figure out what to do. While Cameron and Mick realize that a party is already scheduled to break out at Cameron’s house, so they go to party. Friend dead, who cares? The most unbelievable thing in a movie about a Ghost Shark is that Texas sorority girls will drive to Louisiana to go to a party at a high schooler’s house. Some tattooed jerk is there as well, and after he causes property damage he gets Ghost Sharked the frak up while diving into the pool, his head landing on a beer bottle. Despite everyone fleeing, Mick is too heavy to escape the pool in time and also becomes spectre munch. A second attack and more video evidence of Ghost Shark convinces the cops of nothing, everyone still claiming it’s just a normal shark and the mayor telling everyone to shut up repeatedly. Mayor actor Lucky Johnson might be improvising some of his lines, and they are awesome. When something swims, and it’s just a blur, who you gonna call? 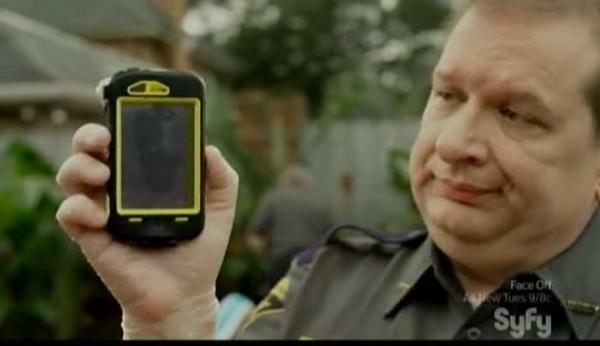 The cops in this town, are lead by a clown. Who you gonna call? Kids on a slip n slide…gets Ghost Sharked! With 13 dead, the mayor is still not talking to the hordes of angry people outside the police station, and the cops are as useless as ever. They even try to arrest Cameron for his own protection, but Ava and Blaise help him escape, the three hiding out while Ava tries to figure out what to do. Luckily, Ava is a fan of listening to drunken rambling, and knows Finch is aware of the problem. Speaking of Finch, he found the dead shark’s body and then proceeds to drink himself stupid, so by the time Ava, Blaise, and Cameron arrive, he can barely speak before he passes out. Ghost Shark chomps Cicely in the bathtub! NOOOOOOO! 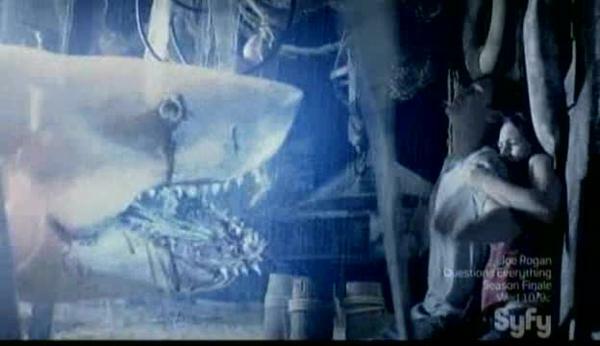 Then Ghost Shark spits her out and the trio return and save her from bleeding to death. YAAAAAAAY! Cicely’s leg is hurt, so Ava has an extra reason to make her stay behind as the Scooby Gang solves the mystery. They do manage to find online information about Finch’s wife Allison drowning years ago. Ava, Blaise, and Cameron visit the town museum, and learn from the very helpful museum curator that Smallport had a Roanoake-like disappearance, a journal saying infected people that were murdered in a cave returned as vengeful ghosts, but he thinks that’s just delusions of an infected journal writer. Ava realizes that’s what happened with the Ghost Shark, and luckily something called a Grimoir (like a memoir, but grim!) has instructions for creating and eliminating ghosts from that cave. Except the museum’s Grimoir was just stolen…by Finch! Also Cameron sets off the smoke alarm by smoking, setting off the sprinklers, which results in one dead museum curator and one dead Cameron. Smoking kills, people! Ava goes to talk to Finch and gets the Grimoir and solve all the problems, while Blaise and Cecily try to save kids at a fire hydrant. Blaise is a failure who can’t do anything right, so the kids try to kill them and Ghost Shark ruins their ride and chomps on two kids. A museum curator, meets his maker. Who you gonna call? When a ghost shark, sets off lots of sparks. Who you gonna call? Finch reads from the book to Ava and they need to make a talisman from the thing that killed the shark – the harpoon in the shark’s body. 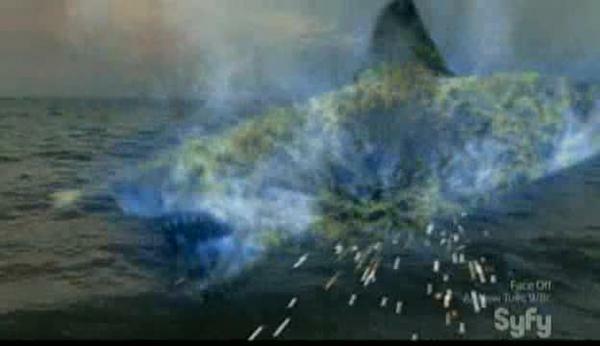 Ava stabs Ghost Shark with harpoon….it explodes! Ghost Shark returns and bites off two fingers from Finch! D’oh! Oh, wait, excuse me. Headslap! That’s what Bull did on Night Court. Finch admits he killed his wife via drunken domestic violence in the cave, and she came back as a ghost. But not as a vengeful ghost, or else she would have killed him. 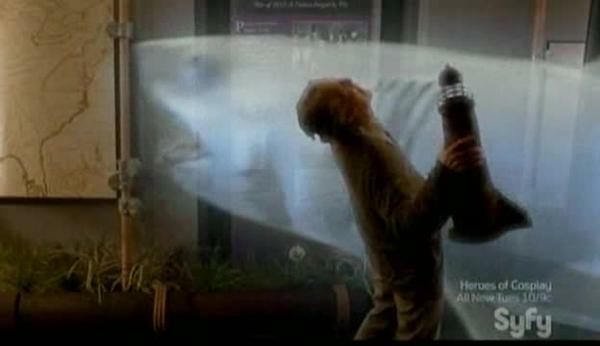 That’s why he doesn’t want to turn off the cave to stop Ghost Shark, because it will make her go away again. But his ghost wife shows him what to do in the book and he accepts that they must blow up the cave. With convenient explosives from the town’s improvement projects. Now let’s pause a minute and examine the film’s use of domestic violence. Finch explains that both he and his wife got violent when they were drunk, and she would turn to beating on him. From the sound of it, both of them beat each other despite loving each other and didn’t take it personal, thus why she didn’t murder him as a ghost. It’s an interesting portrayal that doesn’t excuse the domestic violence, but does sort of gloss over it and gives us knowledge that Finch is probably Ghost Shark food. And it furthered the plot! It’s a weird addition, explaining why Finch is so tortured and giving him motivation to both know what is going on and not to end things too quickly. Though domestic violence is abhorrent, and murder doubly so, it was an admission that I certainly didn’t see coming and that made it an interesting story element. The cave is packed with explosives…but it rains! This lets Ghost Shark put out the fuse line, and then Finch gets Ghost Sharked! Ava has Blaise grab Cicely and hide under a shack from Ghost Shark (who can’t reach them because they are just far enough back from the rain to be safe!) 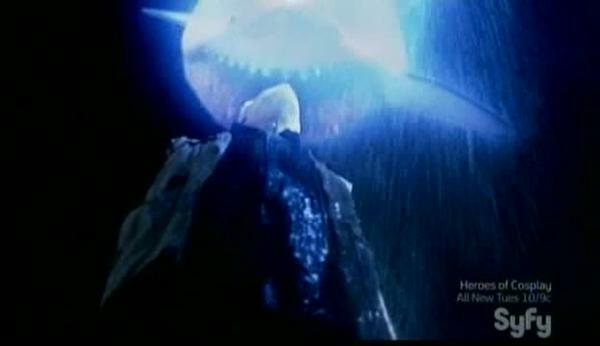 Ghost Shark menaces them and also does random jumps through the rain attacking Ava, even jumping through cave walls. But Ava relights the fuse and jumps into the ocean just as the cave explodes. Ghost Shark swims at her with his dying breath (second dying breath? ), and eats her just as he blows up. Which means Ava lives! Ghost Shark: Busted! When you’re half the man, you use to be, who you gonna call? How many Ghostbuster jokes will be in these captions? I called someone. Can you guess who? This is why New England has such an anti-witch stance back in the day! It was a day like any other. The sun shined, the beach beckoned. Then the Ghost Shark came, and humanity was changed forever. Who left Teen Mom playing on the TV again? 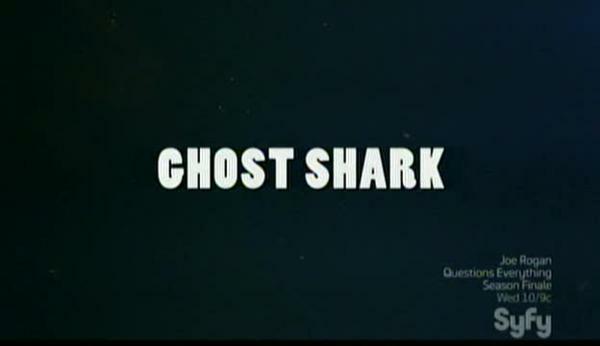 The cast of Kids ain’t hearing this Ghost Shark nonsense! I’m the Ghost Shark with the most bark! Tonight we dine on shark fin soup!